The 466 MHz model shipped with a 16 MB ATI RAGE 128 Pro graphics card and used a PPC 7400 processor. The 533 MHz model used a PPC 7410 processor. The 667 and 733 MHz models used a PowerPC 7450 processor, which included a 256 kB 1:1 on-chip level 2 cache. These models also included a 1 MB Backside level 3 cache, running at a 1:3 ratio to the speed processor. A 32 MB ATI RADEON card was availble on all models as a BTO option. A dual 533-MHz 7410 model was also available BTO. The 733 MHz model included a 24x/8x/4x/6x/2x Combo CD-RW/DVD-R drive. The 667 MHz model was discontinued in March 2001. Announced in January 2001, the PowerMac G4 (Digital Audio) was the first speed increase for the PowerMac line in over a year. The G4 (Digital Audio) was so-named because of a new Built-in Amplifier, designed to drive USB speakers, along with the conventional minijack line output. The G4 (DA) included a number of architectural improvements, including a 133 MHz bus, 4 PCI slots, and a 1 GB/s main-memory bus. PCI throughput was enhanced by the removal of the PCI bridge (the main memory controller now communicated directly with the PCI bus.). Notably missing from the G4 (DA) was multiprocessing. With the exception of a dual-533 MHz BTO option from the Apple Store, all models included a single processor. This was, according to Steve Jobs, the only way Apple would be able to ship the 667 and 733 MHz models in sufficient quantities. The G4 (DA) shipped with two new flavors of G4: The low-end models shipped with the PPC 7410 processor, a lower-power variant of the 7400. The higher-end machines shipped with a PPC 7450 processor, which in addition to an on-chip 256 kB L2 Cache, and had four Altivec ("Velocity Engine") units. 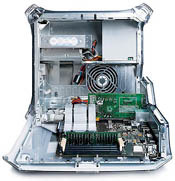 The PowerMac G4 (DA) shipped in four configurations: The 466 MHz configuration included 128 MB of RAM and 30 GB hard drive, for $1699. The 533 MHz configuration included 128 MB of RAM and a 40 GB hard drive for $2199 ($2499 for the dual-533 model). 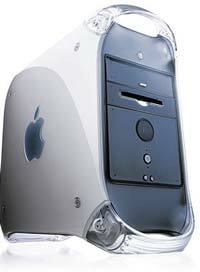 The 667 MHz configuration included 256 MB of RAM and a 60 GB hard drive for $2799. Finally, the 733 MHz configuration included 256 MB of RAM, a 60 GB hard drive for $3499. All configurations included a CD-RW drive, instead of the DVD-ROM drive of the previous G4 models (DVD-ROM was available BTO). The 733 MHz came with an innovative new "superdrive" which could read and write both CDs and DVDs. It was also bundled with Apple's iDVD, a simple DVD-Authoring application.